I love the trade cards we hold at the Archives Centre, I always have done. They are so decorative as well as being packed with information about the business they are advertising, who owned it, what it sold and where it was located. 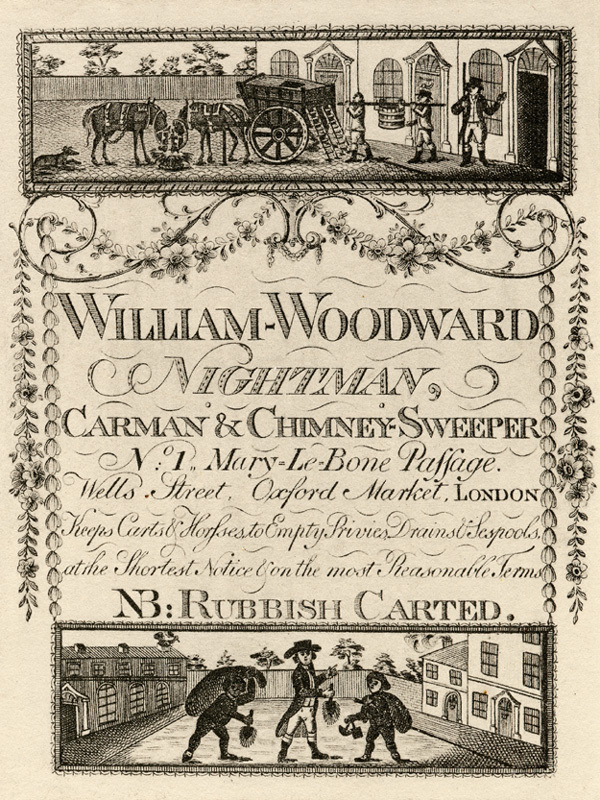 Trade card of William Woodward, nightman, 1 Marylebone Passage, Wells Street, c1820. Image property of Westminster City Archives. Westminster City Archives has over 300 trade cards, mostly dating from the mid-18th century, so the main decorative feature is Rococo shell patterns in keeping with the style of the time. They also frequently include a picture of the workshop or shop and the products they made or sold. Business premises were known by signs, a bit like modern public house signs, before street numbering was introduced in the 1760s. 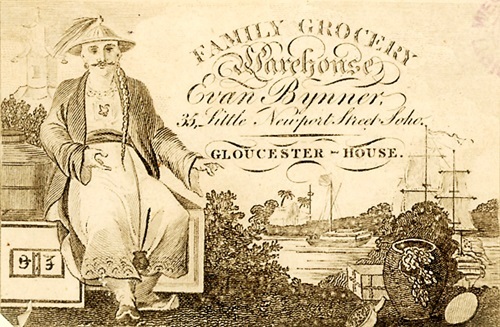 Trade card of Evan Bynner, family grocery warehouse, 35 Little Newport Street, late 18th century. Image property of Westminster City Archives. One of my favourite cards from the collection is that of Evan Bynner, family grocer, whose trade card contains a picture of a Chinese man in a conical hat. 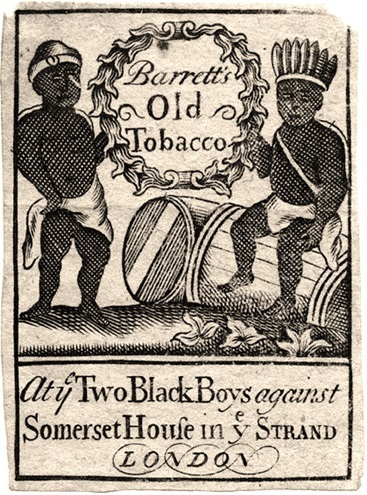 Trade cards often contain interesting information about racial stereotypes in the 18th century, as we can also see from the one for Barrett’s old tobacco at the sign of the Two Black Boys against Somerset House. Trade card for Barrett’s old tobacco at the sign of the Two Black Boys against Somerset House, Strand, 18th century. Image property of Westminster City Archives. We have a postcard for sale in our bookshop of the trade card of William Woodward of Marylebone (pictured at the top of the page), who removed nightsoil (no prizes for guessing what that was in the era of chamber pots!) and other rubbish, emptied drains and cesspits, and swept chimneys in about 1820. 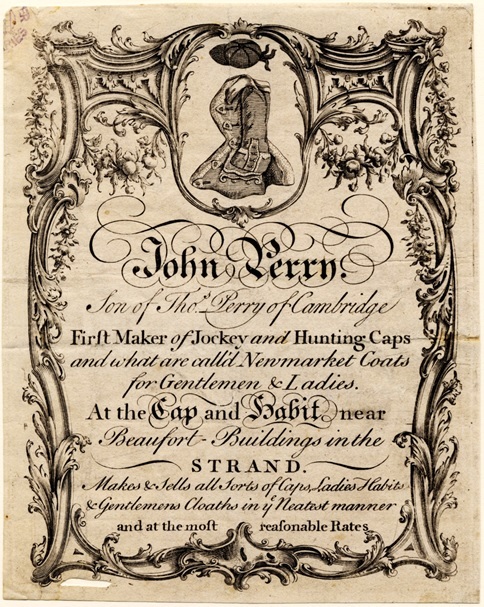 Trade card of John Perry, maker of jockey and hunting caps, at the sign of the Cap and Habit, Beaufort Buildings, Strand, mid-18th century. Image property of Westminster City Archives. Other interesting trades show up in the trade cards of John Perry, maker of jockey and hunting caps, and Richard Siddall, chemist. Perry’s language is as flowery as the border on his card – he “Makes and sells all sorts of Caps, Ladies Habits & Gentlemens Cloaths in ye Neatest manner and at the most reasonable Rates” – and Siddall’s weird and wonderful picture makes him look more like a medieval alchemist than a purveyor of “Chymical and Calenical Medicines With all Sorts of Druggs”. 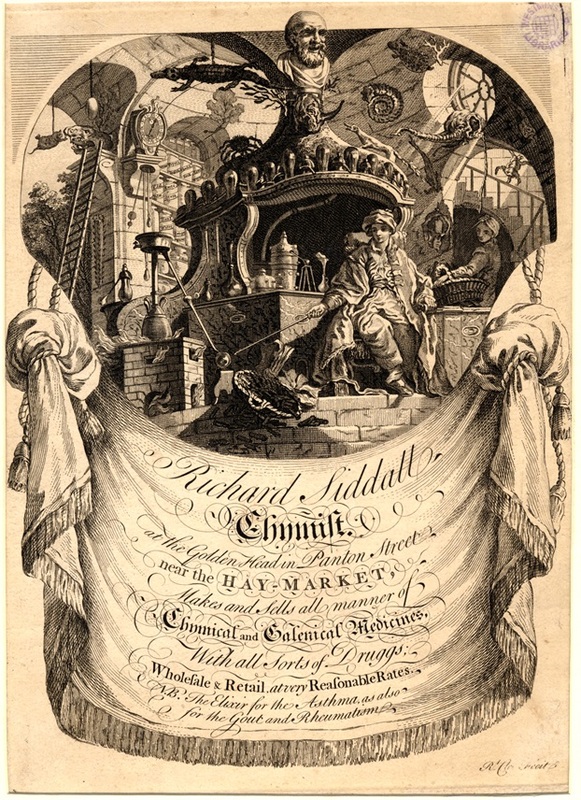 Trade card of Richard Siddall, chymist (sic), at the sign of the Golden Head, Panton Street, 18th century. Image property of Westminster City Archives. The most famous trade card collection in the country is the Ambrose Heal Collection. Ambrose Heal was a member of the Heal’s furniture shop family on Tottenham Court Road, who bequeathed his collection to the British Museum. He also wrote several books on the subject, one of which, called London Tradesmen’s Cards of the XVIII Century: An Account of Their Origin and Use, 1968, containing over 100 illustrations, can be seen in the Archives Centre search room. Why not come along and have a look for yourself? And if all this has whetted your appetite, have a browse through a fascinating collection of trade cards via the John Johnson Collection of ephemera, held at the Bodleian Library in Oxford. You can view the collection online – just log in with your library card number! This entry was posted in Archives Centre, Books and tagged adverts, Ambrose Heal Collection, archives, British Museum, business, ephemera, John Johnson Collection, postcard, trade, trade cards. Bookmark the permalink.